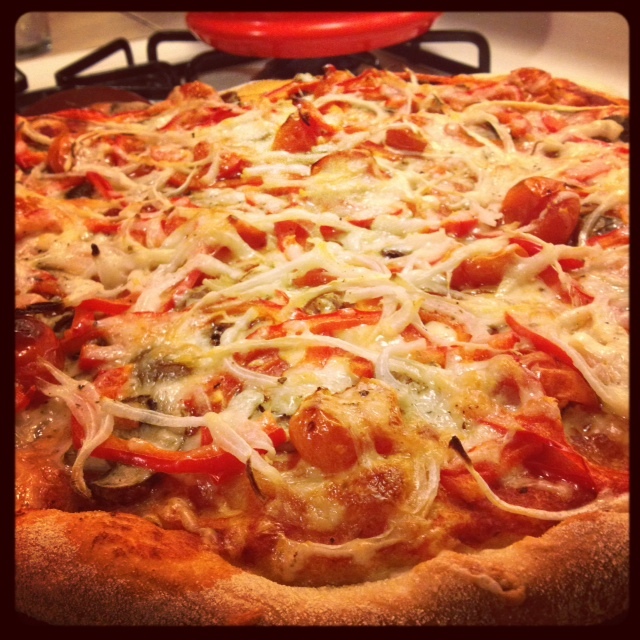 Make pizza night extra special | Make it! My first day of outdoor Boot Camp yesterday morning and….PIZZA for DINNER! Sounds totally ridiculous, I know. But the best way to control what’s on your pizza is to make it yourself. We’ve made our own crust in the past but opted for the next best thing last night — freshly made dough from our favorite local pizza shop. Truth be told, it’s much tastier than store bought dough…and cheaper. Most pizza shops only charge a dollar or so for a “dough ball”. We like our crust thin so 1 dough ball is plenty. Also, did you know the the “fresh” dough you buy in your local grocery store is often made, frozen & THEN put in the refrigerated section to thaw? Yuck! Make sure the dough is at room temp before you attempt to roll or toss it. Coat it with a little bit of flour or cornmeal (I like the crunch cornmeal adds after it’s baked) so it’s easy to form & doesn’t stick to your hands. Patting it into a flat disk before rolling or tossing makes it easier to get an even shape. If tossing or stretching by hand (I prefer this method), use the tops of your hands/knuckles (vs. finger tips) and pull your hands outward, gently stretching the dough. This will help you avoid making any holes or tears. We loaded the pizza up with our favorite sauce and thinly sliced veggies (mushrooms, onions, red pepper & tomatoes). Tomatoes aren’t really tasty yet but Jess got 2 pints of cherry tomatoes on a crazy sale at the grocery store. We roasted them in the oven before adding to them to the pizza (just toss a little bit of olive oil, salt & pepper with the tomatoes then spread them on a baking sheet & roast for about 15-20 minutes in a 400 degree oven). Roasting is a great trick for making tomatoes that aren’t in season super delicious. Okay, consider the truth officially out. In high school (and summers in college), I worked at a pizza shop (affectionately knick named the “Pizza Shanty”) on Cape Cod, so I know a few secrets. Cheese :: We generally use low fat cheese or regular cheese (just less of it). Jess recently bought some blocks of cheese that we’ve been shredding & slicing. It’s much more economical (thrifty!). I’ll admit, I’d gotten used to the convenience of buying shredded cheese but my parents always bought the blocks & shredded or sliced it. You could also buy local cheese at the farmer’s market or artisanal shop & make your pizza a little extra special! We like to use a variety of cheeses on our pizza. Last night: white cheddar & monterey jack. Toppings :: Sauce & lightly cheese your dough then layer toppings, meat first, (if you’re just doing veggies, mushrooms count as “meat” so put those down first) then veggies. I like to put onions on last so they get a little caramelized. If you’re using fresh herbs layer them between toppings or sprinkle them on before adding any toppings so they don’t burn in the oven. Last step: sprinkle another light layer of cheese on top before tossing into the oven. Cooking :: We had amazing pizza last summer that was cooked right on the grill. We don’t have a grill but we do have the next best thing…a pizza stone! It’s not just any pizza stone…please read on. We’ve had mixed results with pizza stones in the past. It’s one of those things that never seemed to work quite as promised and often ended up in the back of the cabinet & then for sale at our next yard sale. We’ve also tried cookie sheets, weird pizza pans with holes, etc. Our favorite tool by far is our Emile Henry Pizza Stone. It’s more versatile than your average pizza stone (it can be used on the grill & as a cook top for a variety of other items) and makes the crust super crispy. Preheating the oven is key! And whether you use a stone or cookie sheet, the trick is making sure you preheat it a bit before plopping the raw pizza dough on it. If you’re using a cookie sheet, brush it with a little oil before preheating. The oven temp should be about 425-450 degrees. Cutting :: You don’t need any fancy cutting tools. A longer, sharp chef’s knife will do just fine. If you use a stone, you can cut the pizza right on it. If you use a cookie sheet, transfer pizza to a large wooden cutting board for easier cutting. So…what are your favorite pizza toppings? Do you have any secret tips for making pizza at home?